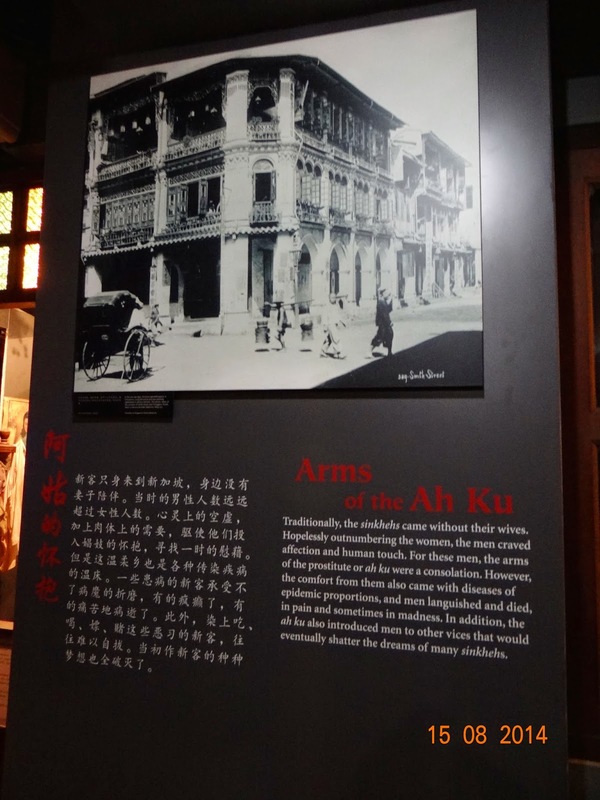 Just about two buildings from the Singapore Coins And Notes Museum lies the Chinatown Heritage Centre, a place highly recommended if you are a history buff and fancy all that stuff about how the city state evolved into what it is today. 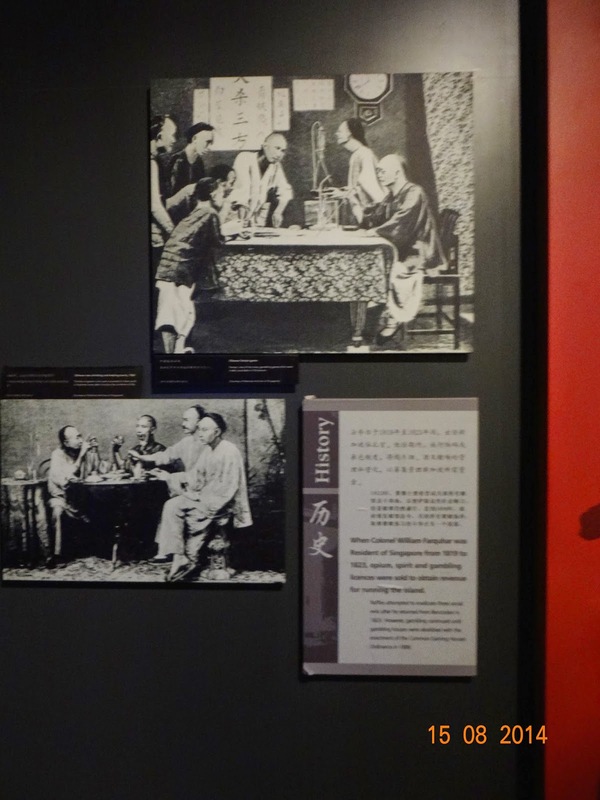 Ever since I planned my trip here, I knew I had to visit the Chinatown Heritage Centre. Undoubtedly, you would conclude I am a history buff, no prizes for guessing that. 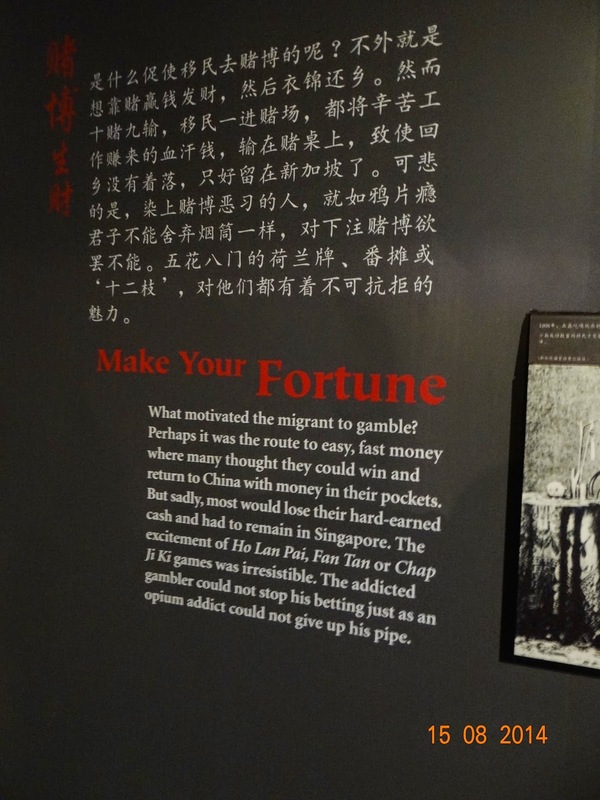 Located in a "shophouse", the museum recreates the magic of yesteryears, the 1800s when poverty stricken immigrants or "sinkheh" (new comers in the Hokkien dialect) landed here in Singapore with a desperate hopefulness, somewhat similar to that of Indian indentured labour that was taken abroad to Mauritius, Fiji, Guyana and other far-off lands. 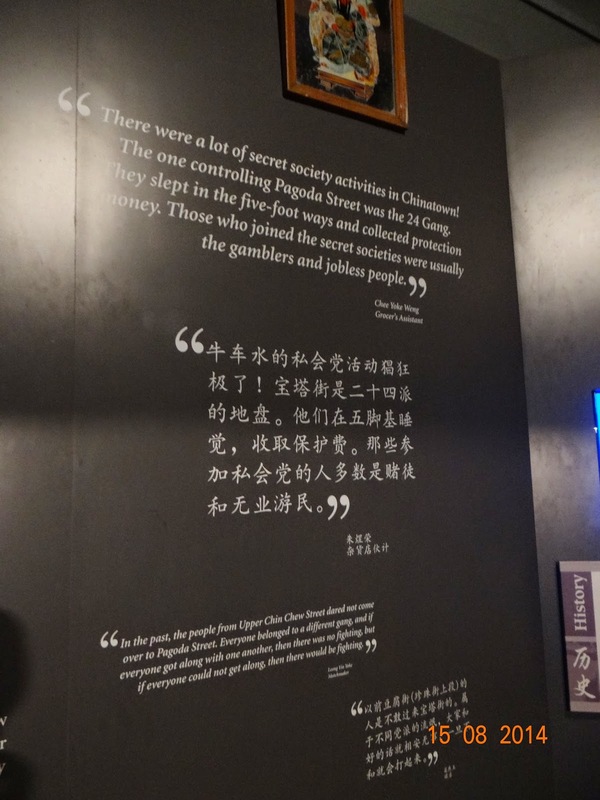 Labour recruiters in mainland China recruited large numbers of unskilled Chinese in the coolie trade to "fuel" the colonial economy overseas in exchange for money to feed their families. This type of trading was known as mai zhu zai (賣豬仔, "selling piglets") by the Chinese. They were promised a good pay and excellent working conditions - these enticements lured them into signing multi-year labor contracts. They hoped they would return home, richer, and would ameliorate the living conditions of their families. 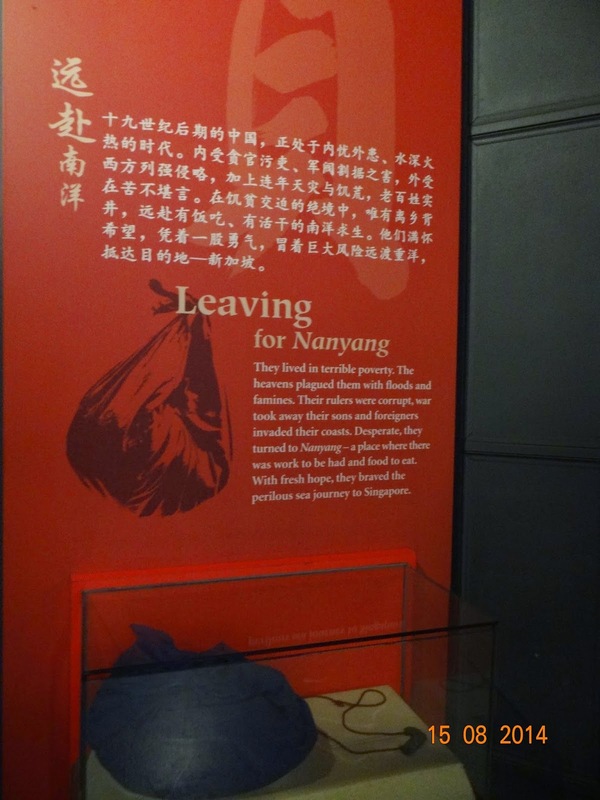 Thus began their journeys aboard Chinese junks or boats to various British colonies around the globe - Fiji, Guyana, South East Asia, Mauritius.... 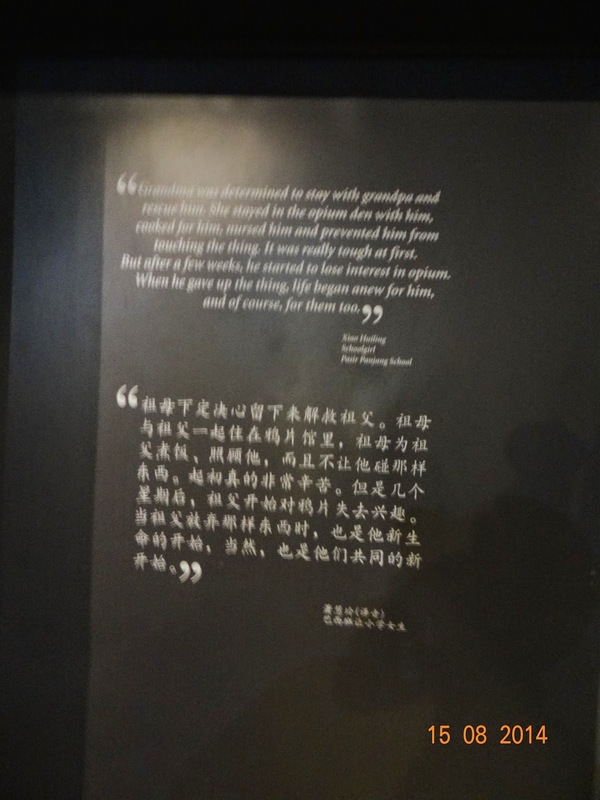 The Chinese, like the Indians were prized for their work-ethic. 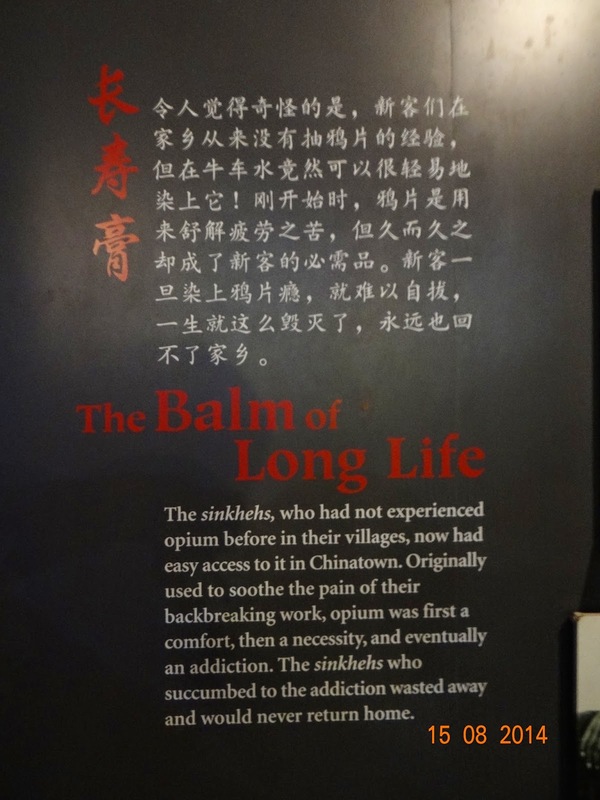 Travel onboard the junks (traditional Chinese boats) was far from comfortable, and many immigrants died en route to Singapore because of bad transport conditions. Usually, they were cheated of their wages and were unable to return to China after their contracts expired. "We were farmers and lived at the Lee Kai village in Samsui. so I volunteered to leave and find work in Singapore. Nobody objected, what could they do? We could not manage with what we had. So I had to come." "I lost my mother when I was young, so I looked after other people's cows in China. My father was old, so I went to my maternal grandmother's house to stay. When she passed away, I was already 16 or 17. Life was tough, so I came to Singapore. I took a Teochew ship from Samsui to Hong Kong, and bought my ship ticket from the hotel in Hong Kong to come to Singapore. I came with a few sisters of mine." With their meagre possessions and with hopes of returning back home, the coolies undertook the arduous journey to Singapore. This reminded me of the heart-rending stories of the Indians in Fiji (Girmityas - a corruption of the word "agreement" under which Indian labour was taken to Fiji) and our diaspora in Guyana (I remembered the tale of the Indian labourer Sujaria, documented by her great-granddaugther, Gaiutra Bahadur in her book, Coolie Women).